Members met with staff at Tiverton Museum on the day which, 100 years ago, saw the Representation of the People Act 1918 achieve Royal Assent. This was the start of the process to allow women the right to vote in 1918. 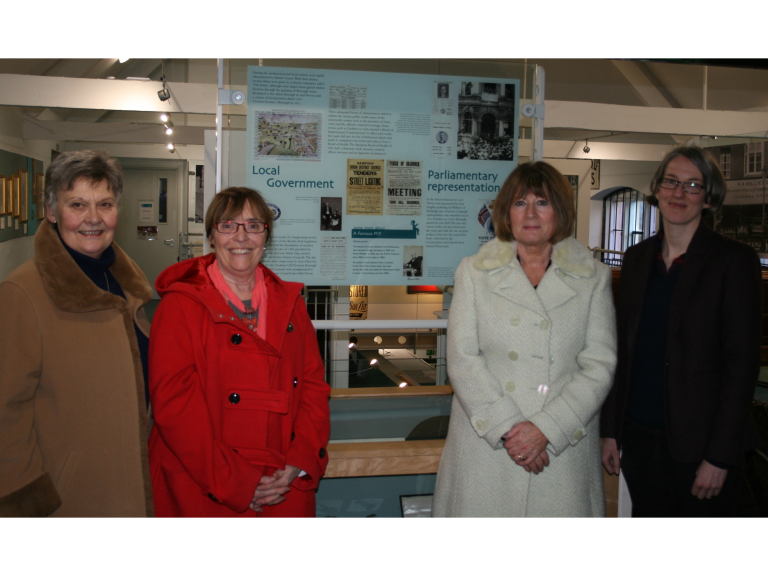 While Tiverton Museum is currently short of artefacts from the Suffragette movement they would welcome input from the community throughout this year of centenary celebrations. The Council is also using the day to remind people to register to vote. Resident’s must be on the Register of Electors in order to vote. If you’re not sure whether your name is on the register, you can contact the Council via customerfirst@middevon.gov.uk or pop into reception at Phoenix House, Tiverton. If you find out that you’re not included on the register, you can either register online at www.gov.uk/register-to-vote or request a form directly from the Council. Tiverton Museum has now re-opened after the winter break with a temporary exhibition on the local legacies of the transatlantic slave trade. The exhibition runs until the 24 March, and the museum is running two related talks on the 22 February and the 22 March which will examine Devon’s links to the slave trade with the second talk looking specifically at Mid Devon. Further celebrations by Mid Devon District Council to mark the centenary will be held throughout the year.